For more than 25 years Total Computer Services, Inc. (TCS) has been the premier provider of computer services, sales and repair to businesses and residents in Bucks, Montgomery and Philadelphia Counties. We have built our reputation by being responsive, knowledgeable and affordable. Our enduring relationships with our client are a testament to our reliability and trustworthiness. We have been voted “Best of Bucks” by our customers for more than 10 years. At Total Computer Services, we understand that any time without a computer can be a major inconvenience or even cause loss of income. We have express services available for those who need a faster turn-around. We Know What We Are Doing And We Have The Awards To Back It Up. 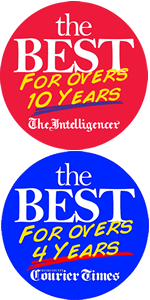 Both our retail locations – Jamison and Richboro – have been awarded The Intelligencer and Bucks County Courier Times “Best of Bucks” for more than 10 years. Since customer satisfaction is our main goal, Total Computer Services assures consistent and efficient computer repair with no hidden costs. All repairs are clearly quoted before any work begins. Total Computer Services is here to help you with all of your home and business IT needs.